After reviewing the three-tender submission, B.D. Clifton Contracting determined to be the lowest bid submitted to the Town for the intersection project. The lowest bid was then further assessed for various cost-saving items within the scope of work and as a result, B.D. Clifton Contracting Ltd. worked with Town staff to revise their bid to meet the preliminary budgeting requirements for Council’s final review and approval. A timeline for the intersection project has the construction work scheduled to begin in May 2019, following Spring Convocation at St. Francis Xavier University, and will wrap up before the Antigonish Highland Games in July. The intersection updates will include: new traffic lights; lane widening that will accommodate tractor-trailers; service upgrades, including a new fire hydrant in front of Whidden Campground; a new traffic island; new sidewalk; shorter cross-walks; raised curb work; and asphalt servicing. “The upgrades to this intersection will greatly improve the traffic flow in this area of Main Street, increasing efficiency and safety for motorists entering and leaving the downtown core of Antigonish. Pedestrians are also ensured a safer route due to shorter crosswalks and better signage to indicate right of ways and reduced traffic congestion,” said Lawrence. The Town is committed to publishing notices on social media, its website, and on local radio leading up to and during the construction work. Once the construction begins, motorists and pedestrians will be encouraged to take alternate routes or plan for delays when entering the work area. pdf Click here (224 KB) , to read the full media release. 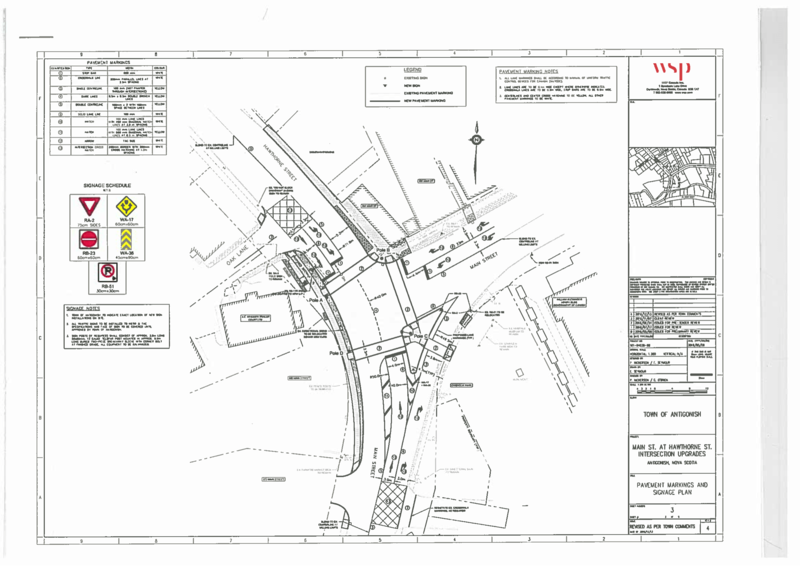 Hawthorne and Main Street intersection with traffic marking plan. pdf Click here (42 KB) , to download a PDF version of the above Hawthorne and Main Street image.